live swine influenza A virus. ARS scientists studying a strain of swine influenza new to this part of the world have found that taking one step backward can lead to many steps forward. Veterinary medical officers Jürgen Richt and Kelly Lager of the ARS National Animal Disease Center (NADC) in Ames, Iowa, are using a process called reverse genetics to gain insight into an alarming development: rapid spread throughout North America of a swine flu type that contains gene segments from birds and humans as well as from pigs. The researchers, who work in NADC's Virus and Prion Diseases of Livestock Research Unit, are using reverse genetics to create new flu viruses in efforts to explore individual components of the virus. The hope is that these components can in turn be exploited by vaccines. 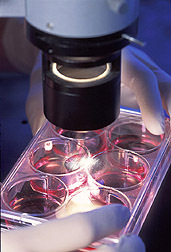 Reverse genetics has been developed over the past decade for virus studies. "The technology has now advanced to where one can confidently generate influenza viruses entirely from cloned DNA resulting from the process," Lager says. Richt says this work is unique because, while the process has been used on human flu strains, it has never been used on swine flu. Swine influenza presents a special challenge in genetics because its genome comprises eight segments of ribonucleic acid, better known as RNA. RNA viruses such as swine flu store their genetic information in RNA, which is more susceptible to mutation than DNA. This allows RNA viruses to evolve far more rapidly than DNA viruses and sometimes makes it hard for an infected host to develop lasting immunity. What's "Reverse" Got To Do With It? What made reverse genetics attractive for exploring the new swine flu strains is that manipulations commonly done on DNA cannot be performed with RNA. (K11000-1) That's where the "reverse" in reverse genetics comes in. "Scientists can convert RNA viruses' genetic material into a DNA state," says Richt. "This is called reverse transcription. At this point, mutations can be introduced into the resulting cloned DNA. Once the DNA is converted back into RNA, the introduced mutations will occur in the genome of the RNA virus. Through this approach, we use cloned DNA to generate swine influenza viruses," says Richt. Richt and Lager—collaborating with veterinary pathologist Bruce H. Janke of Iowa State University and virologist Richard J. Webby of St. Jude Children's Research Hospital in Memphis, Tennessee—generated the A/Swine/Texas/4199-2/98 virus, or TX/98 for short. "When tested in experimentally infected pigs, this generated virus showed characteristics similar to its parental wild type," says Richt. In addition, pigs infected with TX/98 viruses that were genetically altered through mutation or deletion showed significantly less evidence of flu infection, says Lager. "This makes these viruses potential candidates for modified-live vaccines." (K11002-1) Swine influenza is an acute respiratory disease of swine whose symptoms include anorexia, fever, depression, coughing, and troubled breathing. It is among the type A influenza viruses, which can affect humans as well as chickens, ducks, horses, seals, whales, and other animals. Specialists in North America used to diagnose almost exclusively only one type of flu virus in pigs: H1N1. 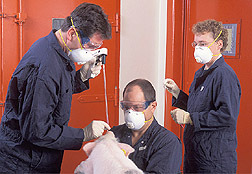 That changed in 1998, when pigs started to be diagnosed with H3N2, a strain that up to that time was rarely seen here. Since then, Lager says, these H3N2 viruses have combined, or reassorted, further with the classical H1N1 viruses, resulting in new H1N2 and H1N1 swine influenza viruses. The increased virulence represented by this new strain also raised concerns, he adds. The H3N2 virus appeared in two types: a double reassortant (DR), labeled as such because it contains gene segments from both human and swine flu; and a triple reassortant (TR) that also contains gene segments from avian viruses. Richt says it's the TR viruses that are causing most of the trouble. "By the end of 1999, these had spread throughout the United States, whereas the DR viruses had not," he says. Birds play an important role in the flu dynamic, providing a global reservoir of A-type viruses. It is believed flu resides harmlessly in birds, where viruses are genetically stable. When a virus from birds infects pigs that are already infected with a swine influenza virus, gene segments from each virus can be mixed, and a new influenza virus can arise. This reassortment likely produced the TR H3N2 virus. Richt and Lager believe reverse genetics can greatly benefit the study of influenza in humans as well as in pigs. "Current human and swine vaccines are inactivated vaccines that vary in efficacy, depending on the match of the vaccine with influenza virus strains circulating in the susceptible population," says Richt. "Modified-live-virus vaccines generated through reverse genetics can stimulate a better, broader immune response than killed-virus vaccines." There is a trade-off, however, in that modified-live-virus vaccines may not be as safe as killed-virus vaccines. "There's always a chance a modified-live-virus vaccine may gain virulence as it replicates in the vaccinated host," Richt says. "But if a modified-live-influenza-virus vaccine can be developed, it may be an important tool in preventing flu in pigs and humans. We also believe reverse genetics can contribute to our understanding of how influenza virus causes disease in various host species. "—By Luis Pons, Agricultural Research Service Information Staff. 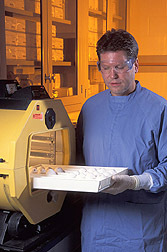 This research is part of Animal Health, an ARS National Program (#103) described on the World Wide Web at www.nps.ars.usda.gov. Jürgen A. Richt and Kelly M. Lager are in the USDA-ARS Virus and Prion Diseases of Livestock Research Unit, National Animal Disease Center, 2300 Dayton Ave., Ames, IA 50010; phone (515) 663-7366 [Richt], (515) 663-7371 [Lager], fax (515) 663-7458. 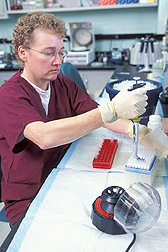 "Reverse Process May Be Key To Developing Swine Flu Vaccine" was published in the February 2004 issue of Agricultural Research magazine.